It’s that time of year again. Christmas in July. Most everything is 20% off. To have your brick, regular pillow, tote, purse or stocking project back by Christmas, have it to us by October 7. If you miss the deadline, the late fee will be $25. Silk Lamé Braid in a bunch of new colors. New knitting magazines… Vogue Knitting and Knit ‘n Style. Bunny Sweater knit by Georgie. On the right you can see a close-up of the bunnies. Pretty awesome, isn’t it? Socks and a shawl finished by Deanne. 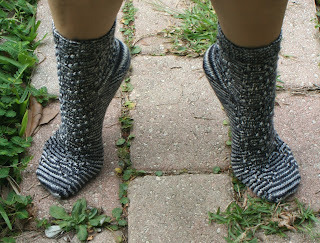 The socks are knit using Kaleidoscope, and the shawl is knit using Silk Splash. Both yarns are by Blue Ridge Yarns. A couple of needlepoint projects back from the finishers. Leona stitched these. So come see us! Don’t forget this Saturday the 27th is Support your LYS day! Sales and more Sales 1 day only! !